SEVEN Gympie graduates will be making history today when they take part in Gympie's first ever university graduation. 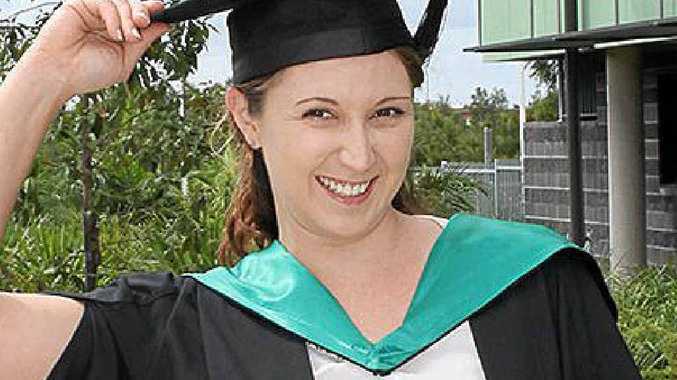 Nursing science graduate Crystel Schuchmann, of Lower Wonga, is among the first students to complete a bachelor of nursing science at USC's Gympie campus, which opened three years ago. The student will attend USC's Gympie recognition ceremony at the town hall this morning at 10.45am, alongside bachelor of business graduand Natasha Jamieson of Gympie. The pair will then join close to 1000 students at the univeristy's Sippy Downs campus, where the first graduations for the year are helping mark the institution's 20th anniversary. Ceremonial hats have been embroidered to celebrate the milestone for the university, which opened in 1996, and will be gifted to the 994 graduates who walk across the stage. Ceremonies for science, health, education and engineering will take place today, and arts, business and law will take place tomorrow. Today's celebration is the icing on the cake for Ms Schuchmann, who has already gained work in her field. She joined the Fraser Coast labs of the USC School of Nursing, Midwifery and Paramedicine and prepares high-tech patient mannequins for scenario-based simulation training of students; making fake wounds and programming simulated heart attacks. Vice-chancellor Professor Greg Hill said graduation ceremonies provided a wonderful opportunity for USC and the wider community to celebrate the accomplishments of students.